Batman The Animated Series Coming to View-Master in Virtual Reality! Home » Operating Systems » Android » Batman The Animated Series Coming to View-Master in Virtual Reality! Last year one of the top toys of the 60s, 70s and 80s was remastered for the modern age when Mattel (with the help of Google) re-released the View-Master as a Virtual Reality headset compatible with Android mobile devices. But how do you make the idea of a View-Master that plays in VR even better? Just add Batman! And that’s exactly what Mattel, OTOYS, Warner Bros. and DC Entertainment has done next with the Batman: The Animated Series Virtual Reality Pack. Unlike the high-end Oculus Rift, and based more around the Google Cardboard, View-Master allows affordable and fun VR experiences – in this instance it’s all about Batman, and the package features Batman themed headset with the iconic bat signal in black and yellow as well as a film reel which can be popped into the viewer just like the old photo reels from childhood’s gone by. However, now powered by your smartphone, these films burst into life in VR allowing the wearer to “explore the Batcave, fly the legendary Batwing, and go on missions”. 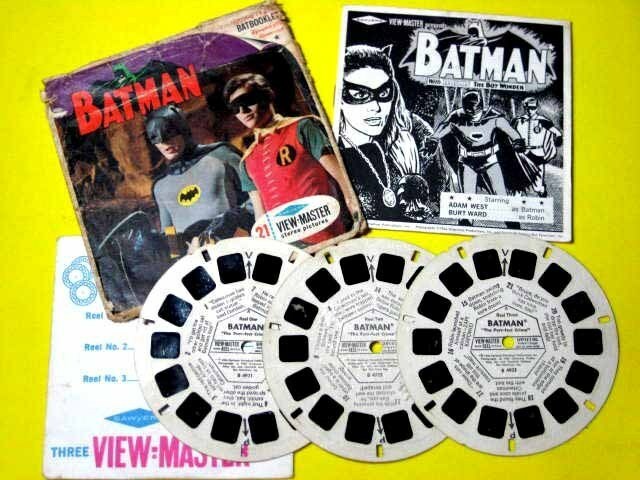 Of course, once you have the View-master headset you can use any of the range of film discs available – not just the Batman ones supplied. If that isn’t cool enough, the clips feature the original voice cast from Batman: The Animated Series including Kevin Conroy as Batman and the inimitable Mark Hamill as The Joker! An official release date for the Batman: The Animated Series Virtual Reality Pack is approaching and pre-orders are said to start soon – so act fast, you wannabe Caped Crusaders! Holy Flashback Batman! The View-Master experience in the 60s.